Michael C. Brannigan is the George and Jane Pfaff Endowed Chair in Ethics and Moral Values at The College of Saint Rose in Albany, New York. Striking a Balance is an unusual, well-written introduction to Asian Thought. In addition to clear, lucid explication of primary concepts, Professor Brannigan provides insightful and philosophically sensitive retelling of a host of stories drawn from classical sources in Hinduism, Buddhism, Zen, Taoism and Confucianism. In the process he invites the reader to explore the ethical values woven into these traditions, to get to know the people whose lives have been shaped by those values, and to reflect on a range of similarities as well as differences between Eastern and Western cultures. Brannigan's style is clear and engaging.... Recommended. Increasingly, Americans are asking whether daunting social problems, from failing schools to violent crime, might be rooted in faulty ethical values–values that place an exaggerated emphasis on individual self-assertion over the goods of family and community. In this readable, deeply informed book, Brannigan explores a variety of non-Western ethical traditions that strike a healthier balance between individual and communal goods. 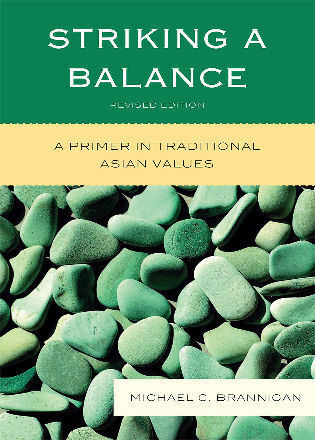 Striking a Balance: A Primer in Traditional Asian Values offers a lucid, thoughtful, and thoroughly engaging review of the major ethical teachings in the dominant Asian traditions. Michael C. Brannigan applies his extensive background and scholarship to craft a concise yet comprehensive introduction to Asian ethics covering the long-standing traditions of Hinduism, Buddhism, Zen Buddhism, Taoism, and Confucianism. He does this through the skillful use of narratives from classical and contemporary Asian literature. Moreover, he demonstrates that, despite differences, these traditions share a unifying theme in their principal ethical teachings - cultivating balance is the fundamental building block for inner harmony, moral activity, and a just society. Through historical overview and discussion of essential ethical themes, Striking Balance presents the rich texture of traditional Asian moral teachings in ways that are appealing, instructive, and enlightening. The work presupposes no prior knowledge of ethics or of Asian traditions and is ideal for all who are interested in learning more about Asian cultures and moral teachings. It is also an invaluable text for students at the introductory as well as upper levels in ethics, Asian studies, philosophy, religion, and humanities.